I remember the Palm Islands Documentary I saw on the National Geographic 2 or 3 years back(maybe even more). I just recalled it a couple of days ago while surfing through the Television. The documentary was amazing. It was being retelecasted on TV a few days back when I recalled it. But well, they were showing the same video years after again! Duh! "The Palm Islands is an artificial archipelago in Dubai, United Arab Emirates on which major commercial and residential infrastructures will be constructed. "Artificial because it's man-made and Archipelago means a group of islands." They are being constructed by Nakheel Properties, a property developer in the United Arab Emirates, who hired Belgian and Dutch dredging and marine contractor Jan De Nul and Van Oord, some of the world's specialists in land reclamation. 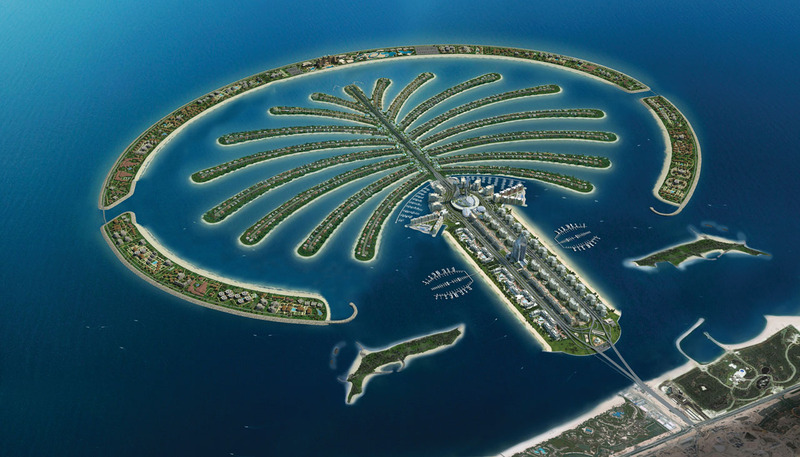 The islands are the Palm Jumeirah, the Palm Jebel Ali and the Palm Deira. Each settlement will be in the shape of a palm tree, topped with a crescent, and will have a large number of residential, leisure and entertainment centers. 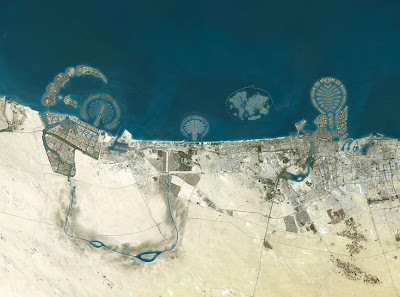 The Palm Islands are located off the coast of The United Arab Emirates in the Persian Gulf and will add 520 kilometers of beaches to the city of Dubai. The first two islands will comprise approximately 100 million cubic meters of rock and sand. Palm Deira will be composed of approximately 1 billion cubic meters of rock and sand. All materials will be quarried in the UAE. Among the three islands there will be over 100 luxury hotels, exclusive residential beach side villas and apartments, marinas, water theme parks, restaurants, shopping malls, sports facilities and health spas. The creation of the Palm Jumeirah began in June 2001. Shortly after, the Palm Jebel Ali was announced and reclamation work began. The Palm Deira, which is planned to have a surface area of 46.35 square kilometres, was announced for development in October 2004. Construction was originally planned to take 10–15 years, but that was before the impact of the global credit crunch hit Dubai. 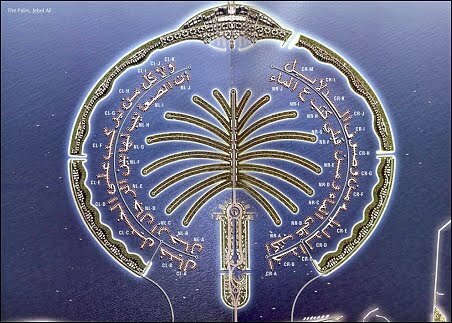 Two other artificial archipelagos, The World and The Universe, are located between the Palm Islands." According to what I read on the Internet a lot of money was spent on this huge and beautiful project making it difficult to fulfil the dreams of all the islands and thus some part of the project were halted for an unknown time period. Moreover due to natural forces and human constraints, the project deadline was changed many-a-times. One of the first buildings on The Palm Jebel Ali is already known. Nakheel invited several architects to design a building on a 300,000 m2 area. The winning design was a building by Royal Haskoning, who also worked on several other projects in Dubai. The building can be seen here. It is now 2012, and the man-made island was completed two weeks ago on September 18, 2012. It is now completed finally. 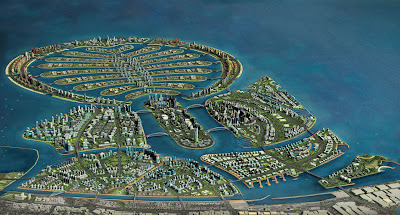 The Palm Deira is an artificial archipelago, part of the Palm Islands, Dubai. It was announced for development in October 2004. 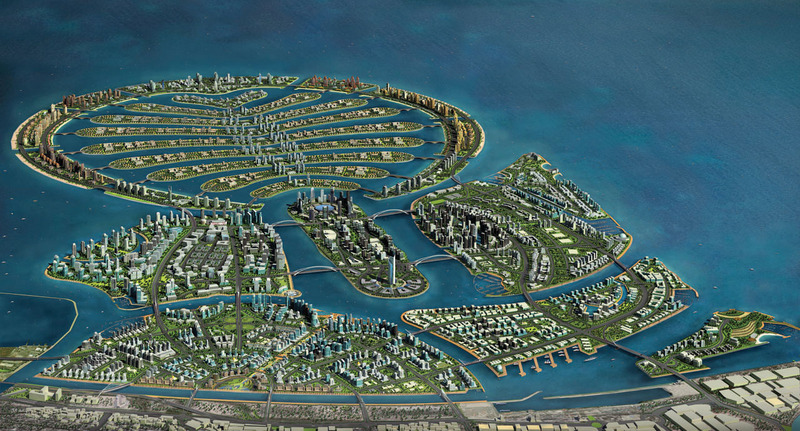 The first announced design was 8 times larger than the Palm Jumeirah, and 5 times larger than the Palm Jebel Ali, and was intended to house one million people. Originally, the design called for a 14 by 8.5 kilometres (8.7 by 5.3 mi) island with 41 fronds. Due to a substantial change in depth in the Persian Gulf the farther out the island goes, the island was redesigned in May 2007. The project then became a 12.5 by 7.5 kilometres (7.8 by 4.7 mi) island with 18 larger fronds. It will be located alongside Deira. The project is currently on-hold. By early October 2007, 20% of the island's reclamation was complete, with a total of 200 million cubic metres (7 billion cubic feet) of sand already used. Then in early April 2008, Nakheel announced that more than a quarter of the total area of the Palm Deira had been reclaimed. This amounted to 300 million cubic metres (10.6 billion cubic feet) of sand. Since the island is so large, it is being developed in several phases. The first one is the creation of Deira Island. This portion of the Palm will sit alongside the Deira Corniche between the entrance to Dubai Creek and Al Hamriya Port. Promotional materials state that Deira Island will act as "the gateway to The Palm Deira" and help to revitalize the aging area of Deira., By early April 2008, 80% of Deira Island Front's reclamation was complete. A new redesign was quietly introduced in November 2008, further reducing the size of the project. Since 2008 the project is on-hold. 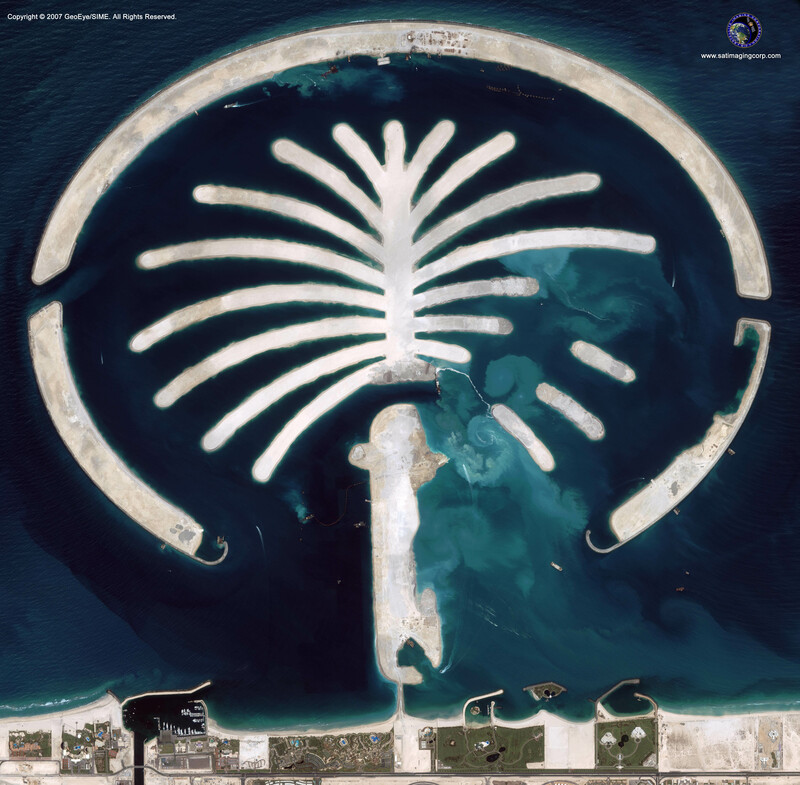 The Palm Jumeirah is in the shape of a palm tree. It consists of a trunk, a crown with 16 fronds, and a surrounding crescent island that forms an 11 kilometres (6.8 mi) long breakwater. The island is 5 by 5 kilometres (3.1 by 3.1 mi) and its total area is larger than 800 football pitches. The crown is connected to the mainland by a 300-metre (980 ft) bridge and the crescent is connected to the top of the palm by a subsea tunnel. Over the next few years, as the tourism phases develop, The Palm Jumeirah is touted as soon to be one of the world’s premier resorts. The Palm Island is the self-declared 'Eighth Wonder of the World'. The island doubled the length of the Dubai coastline. According to the developer's publicity material, the Jumeirah Palm island will feature themed hotels, three types of villas (Signature Villas, Garden Homes and Canal Cove Town Homes), apartment buildings, beaches, marinas, restaurants, and a variety of retail outlets. Palms Islands are the real marvel made by man I must say. If the project was completed as they wished and wanted on time, I guess there would have been no richer country than Dubai in the world all because of the tourism! If you are gonna ask me, I loved this idea of Palm Islands but at the same time I find it scary because of all the water around it, though nature is not wrathful, but if a lot of tourism makes it agitated, the results could be chilling! Palm Island is one of my dream destination! Hahahaha!!! I think you are right, but still it is better to be cautious! that is island? wow, amazing! Yeah! the biggest man-made island! Thanks for taking time for sharing this post,Its really very useful of all of users. I found a lot of informative stuff in your blogs. really thanks for shearing it with us. keep it up.